The Mashpee Lanes Bowl And Bistro had various concerns with the noise levels within the bar and dinning area. 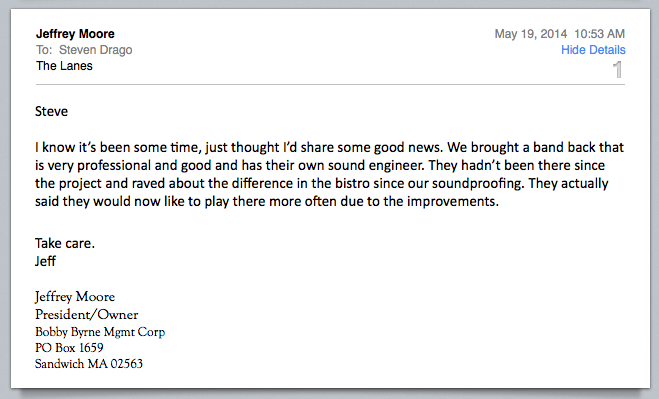 Customers complained about the high level of noise, especially during the weekend nights when the live band played. New England Soundproofing provided and installed various acoustic panels to the ceiling area of the dinning and bar room so that unwanted noise would reduce and people would enjoy their meal peacefully. The Lanes Bowl & Bistro was the perfect acoustical storm, with every variable possible contributing to an unsafe volume. The venue’s concept is as unique as its noise issues: An upscale bowling alley that transforms into a nightclub adjacent to a lunch/dinner bistro that includes a full bar and live entertainment. And if all of these factors didn’t drown out the patrons’ conversations, the high, steel ceilings and exposed ductwork, numerous oversized picture windows, rows of glossy bowling lanes, bare concrete floors, and unadorned wooden tables would join forces in a cacophony that would rival a metal band performing inside a bank vault. Obviously though, noise is part of the venue’s atmosphere and should be invited, but the owners needed to refine the volume to eliminate the deafening echo that made it impossible for the employees to hear the customers and for the customers to hear each other. When owner Jeff Moore asked New England Soundproofing how to decrease the noise level, New England Soundproofing knew the custom acoustic panel would do the trick. New England Soundproofing installed various acoustic panels on the ceiling of the metal ceiling, and also installed acoustic baffles hanging from the ceiling. The 20’ high metal ceiling would create a high reverberation within the room, so putting the panels high in the ceiling not only hid the panels well, but also reduced the reverberation coming form the ceiling. Now customer, staff and even the live bands that play there are more than satisfied with the outcome. We were able to match the colors pretty close and didn’t disturb the décor of the restaurant. Jeff really noticed the difference right away and was even more satisfied when he found out bands now are willing to play at his restaurant more because of the new treatment. With the acoustic treatment, customers are more relaxed and willing to stay long and become repeat customers. To decrease the noise but increase customer satisfaction, give New England Soundproofing a call and we can discuss the various soundproofing options. Call us directly at 781-710-1261 or email us directly at JDrago@NewEnglandSoundproofing.com.